The Richards, Raff & Dunbar Memorial Home, located at 838 E. High St., Springfield, Ohio, is truly one of the most outstanding homes in the city, and is listed on the National Register of Historic Places. The construction process took almost four years before being completed in 1888 as the personal home for American industrialist and two-term Ohio Governor Asa S. Bushnell. 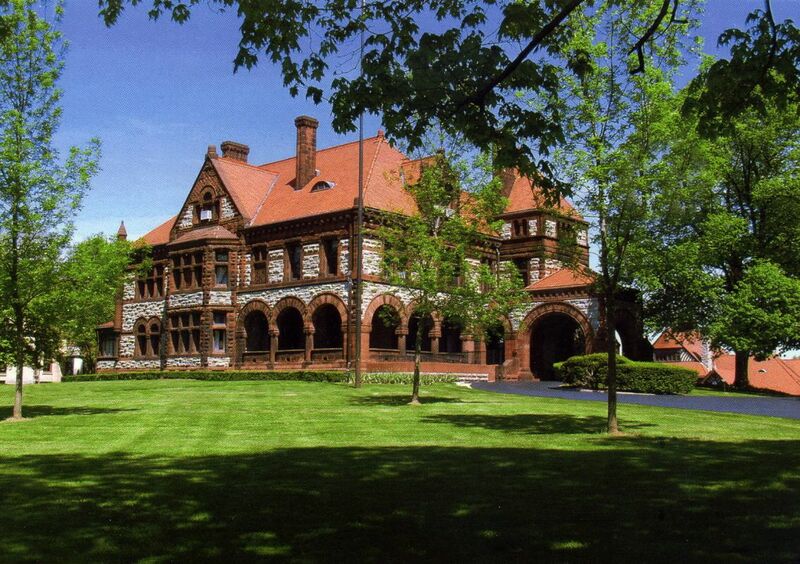 The magnificent mansion, which was designed by renowned architect R. H. Robertson, is said to be one of the finest examples of Richardsonian Romanesque architecture, and is a work of art in itself. Designed for graceful and elegant entertaining, the mansion features 30” thick walls made of stone that was quarried locally, seventeen different types of hand-carved hardwoods throughout, Tiffany stained glass, crystal chandeliers, a third-floor ballroom, a tile roof made from Southern Ohio clay, and an Italian marble fireplace in every room. Additionally, there is a caretaker’s home that is a smaller replica of the mansion, and a three-story stable on the grounds. The mansion’s interior and exterior have been kept in immaculate and all original condition. Bushnell, who was Ohio’s 40th Governor, was a dedicated family man who chose to conduct much of the State’s business from his home in Springfield, in order to be able to spend more time with his wife Ellen Ludlow Bushnell and their three children. Upon his second election to the Governorship, Bushnell gave his inaugural address from the massive front porch of the High Street Mansion. When Governor Bushnell did have to tend to the State’s business in the capitol city of Columbus – approximately 50 miles east of Bushnell’s home - Bushnell’s “commute” by carriage took two days in each direction. He would stop near West Jefferson, Ohio and pick up a fresh team of horses before continuing on his way. Bushnell was also a captain of industry, and envisioned growth and prosperity for the Springfield area. Among his many business interests, he was president of the Warder, Bushnell and Glessner Company, which later became International Harvester – now known as Navistar International; was president of the Springfield Gas Company, and President of the First National Bank of Springfield. Bushnell was also instrumental in bringing the railroad through Springfield and Clark County, and was involved with the city’s telephone company and streetcar line. After Asa Bushnell’s death in 1904, his wife eventually sold the mansion to a prominent Springfield physician, and the mansion remained in the physician’s family until the Depression. The mansion then stood unoccupied for almost ten years before being purchased by a young man from Lawrence County, Ohio, Austin Richards. Richards had come to Springfield to serve his Funeral Director’s Apprenticeship with a local funeral home. He liked the area, and decided to stay. Richards and his wife, Isabelle, opened their first funeral home on W. High St., near the Masonic Temple, but knew they would need a larger home for the funeral business. They purchased the Bushnell Mansion in the mid 1930’s, and after almost two years of preparation – doing most of the work themselves - they opened Austin Richards Memorial Home, and the mansion has remained a funeral home ever since. Upon Mr. Richards’ death in 1978, Isabelle sold the funeral business to Austin’s long-time business associate, S. Frederick Raff, and the firm became known as Austin Richards & Raff Memorial Home. Raff and longtime friend Ted Chapman of Trostel-Chapman Funeral Home in New Carlisle, Ohio, then merged the two funeral homes on January 1, 1984. Raff and Chapman retired on January 1, 1989, and funeral home partner Rick Dunbar became President of the firm. The Springfield location is now known as Richards, Raff & Dunbar Memorial Home; the New Carlisle funeral home is known as Trostel, Chapman, Dunbar & Fraley Funeral Home. For owners Rick and Anne Guyton Dunbar, maintaining the mansion has been a labor of love, and they are dedicated to maintaining the beauty and the integrity of the home and all its splendor. In the mid-1990’s, they completed a $1 million restoration project of the mansion, and as the mansion is on the National Register of Historic Places, the materials, design, and methods used in the restoration had to be done in the same manner in which the home was originally constructed. With careful searching, they found talented craftsmen who were able to complete the restoration using original and custom-crafted materials in order to maintain the integrity of the mansion. They were awarded the Community Beautification Award for Preservation for their efforts. Free tours of the home, which includes brief discussions on history, architecture, and meaningful funeral ceremonies, are by appointment only, and may be arranged by calling Anne Guyton-Dunbar, at (937) 325-1564.